The central bank has issued a 500m Zimbabwe dollar banknote, worth US$2, to try to ease cash shortages amid the world's highest rate of inflation. 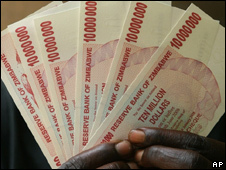 The previous highest denomination note was for Z$250m, issued 10 days ago. Meanwhile, the opposition has rejected the move to delay the presidential run-off, possibly until July, saying it was a government ploy to stay in power. It called for an emergency regional summit, urging neighbouring countries to take "firm resolutions". 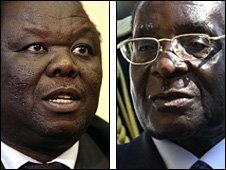 Movement for Democratic Change (MDC) leader Morgan Tsvangirai gained more votes than President Robert Mugabe in the first round on 29 March, but did not pass the 50% threshold to be elected, according to the official results. "We would like to express our great outrage at that disregard of Zimbabwe's laws and the people's will," MDC Secretary General Tendai Biti told a news conference in South Africa. In a statement, he said the Southern African Development Community (Sadc) should "take note of the massacres taking place in the country". Meanwhile, an election observer group has appealed for clothing, bedding and food for monitors affected by the violence. The Zimbabwe Election Support Network deployed 8,000 monitors for the March polls and says some of its members have been assaulted and had their homes burnt down, with new cases daily. Zimbabwe's annual inflation rate is 165,000% and one economist said prices now double every week. "Prices are now doubling every week instead of every month and it is hard to see how we can survive to the end of June or how an election will be feasible at all if things continue to deteriorate at this pace," said Harare economist John Robertson, according to the AP news agency. This is the fourth set of new banknotes to be introduced this year. At independence in 1980, one Zimbabwe dollar was worth more than US$1. Just one in five of the adult population is believed to have a formal job and some three million people have left the country for a new life in South Africa. The economy has been in trouble for several years, with supplies of basic foodstuffs, cooking oil and petrol all running low. The government has also suspended import duty on some basic goods, such as cooking oil, rice and soap in a bid to counter inflation. The run-off was due to be held by 23 May - 21 days after the results of the first round were announced - but the government has issued an emergency law to give it 90 days to organise the new poll. The Zimbabwe Electoral Commission (Zec) said it was not possible to hold the run-off so quickly. But Mr Biti said that Zec's decision was unconstitutional. "In short, Zec's decision cements the coup against the constitution," he said in a statement. He added that 35 people have been killed in a campaign of violence around the country since the election on 29 March, and "thousands displaced, thousands tortured and hundreds of houses burnt". He said that Sadc had so far failed to give decisive leadership on Zimbabwe. He called for the body to send peace observers and monitoring police or an army unit to enforce peace. Meanwhile, the justice minister has proposed establishing cross-party teams to probe acts of political violence. "Whenever there is a claim of an act of politically motivated violence committed, it should be very good that we form joint teams made up of the Zanu-PF and MDC so that we can establish the veracity of these claims," Patrick Chinamasa told state television. The MDC had threatened to boycott the second round of voting after accusing Zanu-PF of trying to rig it but over the weekend Mr Tsvangirai said he would take part. He has been in neighbouring countries since the first round because of alleged threats to his life. Bu the MDC said on Wednesday that Mr Tsvangirai would return to address a rally in Bulawayo on Sunday.